There’s a lot more to food than taste, smell and appearance. Its origin, cultivation, consumption, and symbolism, can tells us a lot about the people who eat it, their status in society, and the culture they live in. That’s what Medieval Tastes: Food Cooking, And The Table is about. So, if you’re simply interested in a few Medieval food recipes, be warned: you won’t find any here. But if you want to know what food people in the Middle Ages, particularly in Italy, ate and why, and how modern cooking was born, go right ahead. This book is a treasure trove of information on all things culinary in this intriguing era. Back then, cuisine was heavy influenced by Roman tradition, but the Near Eastern spice routes brought new flavours to the tables. The result were dishes that delighted (or shocked?) the palate with their mix of contrasting flavours. For instance, did you know that pasta was prepared with both cinnamon and sugar? The Medieval diet was more varied than we assume, but what you ate heavily depended on your place in the social order. While at the beginning of the Middle Ages, meat was present on everyone’s tables, towards its end, it became rarer and rarer in a peasant’s kitchen. Some types of meat disappeared completely from their tables, being reserved only for the rich. Onions, due to their unpleasant smell, was instead fit only for the poor. Butter, on the other hand, had a different fate. Initially considered by the Romans as food suitable only for savage and primitive people, its popularity spread, becoming the basis for many delicious dishes. The debate on whether butter, olive oil, or lard was better for cooking also depended on social class and location. Flour-based preparations, such as polenta and pasta, were refined during this era too. Pasta played an important role in the adoption of the fork. It was a difficult dish to eat with your hands, which is why the Italians were among the first to use it. These are just some of the fascinating culinary tidbits you’ll find in this book. But it’s a read to taste slowly, one small bite at a time. That’s because the writing style is far from engaging. Very academic, Montanari uses a flowery and unnecessary style that doesn’t make the book flow easily at all. Reading it is a struggle, but one that’s worth it if you’re interested in Medieval gastronomy. 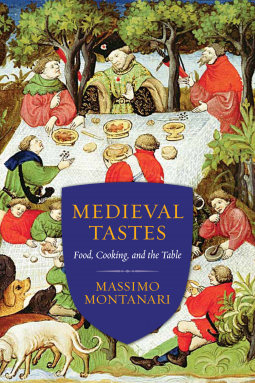 Although written in a flowery, academic style that’s sometimes hard to follow, Medieval Tastes: Food, Cooking, And The Table provides a fascinating insight into every aspect of Medieval food cultivation, preparation, symbolism, and social and cultural significance.